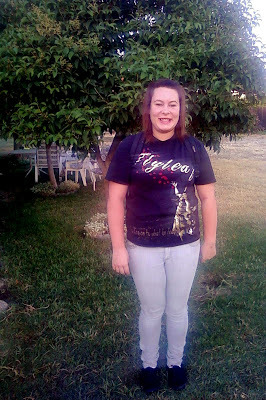 Here's a picture of Jessica on her first day of school. Yeah stupid phone doesn't want to send the picture. Even though it DID send it this morning to my work email. Which of course, I can't get into at home. So I guess you'll have to wait until tomorrow to see my SOPHOMORE. I swear it was just yesterday she was in Kindy! Little kids are at my mom's until Friday. I came home from work and took a nap. Scott and I had Smirnoff's for dinner and some "popcorn chicken" warmed up in the microwave because we are feeling all motivated to cook and such. ETA Here's a crappy phone picture, maybe I can buy a cheap new camera this weekend! They grow up so fast..THANK GOD is all I can say! I feel your pain! HUGS! Best dinner ever is cold cereal. You're not old. I promise. Hey at least she let you take a picture of her!! Lucky! They are in school already? Mine don't start until the 24th. Ack It's Just Not FAIR!! My Brother's Dog is Crazy!